Celebrating twenty years of experience this year, California based Groove Tubes is now manufacturing the GT6L6GE in the USA. The GT6L6GE is a beam tetrode with a maximum anode dissipation of 25 watts when used in a common Class A/B circuit design. This new tube is a direct reproduction of the famous "clear top" General Electric version from the 1950's. Groove Tubes has chosen to use many of the same machines as employed to originally make this tubes over five decades ago! Grove Tubes was also able to purchased a good quantity of original GE plate material to support quite a few years of production. This is the same multi-layered alloy material that will eventually turn gray due to the tube operations heating process. Matched pairs are $90 while matched quartets are $180. Other matched quantities are available upon request. TacT Audio's new 410 subwoofer is optimized for corner placement and expected to be powered by one of the firm's digital amplifiers. The W410 boasts four 10" woofers and a claimed frequency response of 12Hz - 350Hz, a high 92dB sensitivity and maximum SPLs of 124dB. Standard finishes include Maple and Cherry while Rosewood is optional. The W410 weighs 142 lbs. The MH1 floorstander can be supplied with our without passive crossover, the latter to be driven by TacT's own S 2150 amplifier's digital electronic crossover. The dual 6.5" mid/woofers are custom ScanSpeak units with a patented inductance stabilizing magnet shunt system, a cone slotted with elastomer sections to reduce cone resonance, and an open-frame magnesium basket said to reduce mechanical compression. The 96dB efficient ScanSepak RingRadiator tweeter is claimed to extend to 60kHz without breakup. The drivers are mounted in a CNC machined aluminum baffle, while the MH1 cabinet is constructed from a laminate that allows curved side panels. Each speaker comes with calibration files for the woofer and tweeter sections and their combined response which are loaded into the S2150 or M1 M.III amplifier driving the speaker. This is claimed to calibrate it to within 0.2dB of the desired anechoic response. Basic specs for the MH1 include: frequency response from 35Hz to 60kHz; 92dB sensitivity; 4-ohm nominal impedance; 118dB maximal SPL; weight of 103 lbs; and matching finishes to the 410 subwoofer. 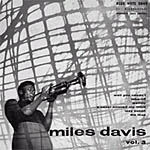 Classic Records announced the following release updates for April 2002: Miles Davis Vol. 3 ($30), a Signature Blue Note 10" mono re-issue; Billie Holiday Songs for Distingue Lovers ($30), a Classic Encore Series re-issue; Rimsky-Korsakov Antar ($30), a Vangard LP Series re-issue; Ameriques Varese ($30) from the same Vangard series; Louis Armstrong & Duke Ellington The Great Reunion ($30),compiled from the New World, Xanadu, Virgin, Roulette labels and others; and the Pete Townshend albums Another Scoop ($40) and Scoop 3 Classic D.A.D." ($35). May releases include the soundtrack double set to Vanilla Sky; Sarah McLachlan's Touch; John Coltrane's massive quad set Blue Train; and Cliff Jordan's equivalent Cliff Craft set. Part of Sonus Faber's Classic line that includes the Musica integrated amplifier, the Electra Amator II, the Guarneri Homage and the Amati Homage, the new Cremona ($7,495) benefits from a similarly bow-shaped Maple cabinet as the Amati but eschews the latter's complex interlocking joinery. Expected availability is May 2002, and the importer warns that only very limited numbers of this speaker will initially enter the US. The Cremona measures 8.9" x 18.1" x 42.9" (WxDxH) and its frequency response is given as 32Hz to 40kHz. Wilson Audio Specialties introduces the 7th iteration of its venerable WATT/Puppy system that's been available in various incarnations for the last 16 years. The new System 7 will debut at the Home Entertainment Event in NYC, May 30 thru June 2, 2002. According to the company's press release, the changes from the WATT/Puppy 6 are as follows: strategic use of a new cabinet material in conjunction with the existing "X" material for reduced enclosure resonance and a lowered noise floor; an upgraded Puppy woofer; crossover changes especially in the area of phase delay tuning for greater transient speed and decay; and subtle cosmetic changes to refine the overall visual integration between the monitor head and subwoofer base. Parasound of San Francisco introduces the Halo component range as its new upscale offering while its traditional product line will henceforth be known as Parasound Classic. The first components under the Halo Series 3 umbrella are the 125wpc THX Ultra2 certified A 23 power amplifier ($850) that offers 200 watts into 4 ohms and can be bridged for 400 watts mono (shown right); the P 3 preamplifier ($800) based on the new Burr Brown OPA2134 IC, and the T 3 FM/AM tuner ($600), to be followed by a 7.5-channel controller, a full line of stereo and multi-channel power amplifiers and multi-format disc players. Some engineering highlights for the new Halo series include fully-differential balanced circuits with XLR type connectors; pure Class A JFET input and MOSFET driver stages; DC servos to eliminate capacitors in the signal path; and the use of Class A/AB circuitry that operates in Class A at virtually all reasonable listening levels. President Richard Schram also added that chief analog designer, John Curl, was authorized to specify higher grade electronic components for this new series. FPS' new F1 loudspeaker is billed as a "reference-level, full-range tower speaker". It utilizes triple-section modified flat-panel midrange diaphragms in an MTM array centered on a softdome tweeter and 4.25" cone "couplers" between the tweeter and the panel arrays. Dual front-firing 7-inch woofers below utilize progressive transmission-line loading. A unique element of the F1 panels is suspension via a compliant half-roll surround rather than the more customary fixed-edge mounting. High-energy neodymium motors drive the film diaphragms that use etched voice coils for magnetic coupling. A total of 11 drive elements and 77 magnets make up each F1. Measuring 9" x 58" x 19" (WxHxD) and weighing 75 lbs, the F1 sports a claimed frequency response pf 20Hz to 25kHz (-6dB / -3dB), 92dB sensitivity, crossover points at 200HZ, 600HZ and 3kHz and 180 degrees of dispersion. The power rating is given as 200 watt RMS maximum and 1,000 watts peak. Albert von Schweikert is credited as contributing designer. Vienna Acoustics' new Strauss ($5,990) floorstanding loudspeaker is a dual mid-woofer 10-inch three-way with side-firing woofer. Frequency response is a claimed 27 - 30,000Hz and dimensions are 7.7" x 45.7" x 16.7" (WxHxD). Rosewood finish adds a $500 premium to the base price. The Strauss is expected to begin shipping in May like its companion center channel, the Oratorio ($2,990). Vienna Acoustics is also releasing speakers optimized for smaller European apartments - the Schoenberg ($2,500), the Webern ($2,000) and the Berg ($1,000). Mirage Loudspeakers of Canada introduces the OMNISAT ($350 each), a small coaxial twin-driver design that uses reflectors to turn the dispersion pattern of its up-firing drivers into the firm's trademark spherical, 70% reflected vs. 30% direct output. The OMNISAT combines a 1" PTH (pure titanium hybrid) tweeter with a 4.5" Polypropylene Titanium deposit cone for a frequency response of 70Hz to 20kHz and is available in black, white and titanium, with mounting options spanning the gamut from on-wall and stand to bookshelf, upright as well as inverted. The OMNISAT weighs 7 lbs and measures 8" x 6.25" x 8" (HxWxD). 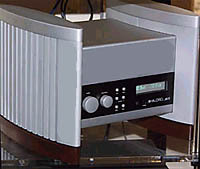 The Musical Fidelity 24-bit Delta-Sigma A3-24 DAC ($1,195) is said to be based on the firm's Limited Edition, Nu-Vista 3D CD player ($4,995 ) and merely eschews the latter's tube output stage. The A3-24 DAC uses the CS8420 sample-rate converted to upsample to 96kHZ while a series-connected second chip performs final upsampling to 192kHz. Consumers can decide which upsampling scheme sounds better with their particular transport (the manufacturer feels Sony-based transports sound better upsampled to 96kHz only). With a S/N ratio of 112 - 116dB, the A3-24 DAC is 10dB quieter than Musical Fidelity's original A3 CD player. In line with the firm's preference for choke-filtered power supplies, the A3-24 DAC uses the same chokes employed in the Nu-Vista CD player. Connectivity includes RCA and Toslink inputs and RCA analog and digital outputs. The Hagerman Technology Trumpet is a vacuum tube phono pre-amplifier ($1,895), fully balanced, Class A, zero-feedback, choke-regulated and equipped with a passive split RIAA stage and polarity control. Eight hand-matched Russian tubes (four 12AX7 and four 12AU7) complement the Trumpet's nearly dual-mono construction. Any combination of RCA or XLR terminals for inputs and outputs are available. Circuit highlights include a continuous current, fully choke-regulated bipolar high voltage power supply; choke-regulated dc heater supply; Class A differential long-tailed gain pairs; current source loaded cathode follower outputs; and passive shunt power supply regulation. Specifications are: +44dB gain (+50dB balanced); 47kOhm input impedance; 750 ohm output impedance; 5Hz to 50kHz bandwidth; SNR of 66dB ref 5mV A-weighted; and overload of 250mV/1kHz, with 1% distortion. The Trumpet weighs 14 lbs. Omega Loudspeakers of Norwalk/CT offers their very own TS1 ($699/pair) high-sensitivity loudspeaker factory-direct to save the consumer the traditional dealer upcharge. The TS1 mates well with low-power SET amplifiers. It is a crossover-less, full-range 8-ohm loudspeaker with an 8-inch Fostex-based Whizzer cone driver that achieves a high 96dB sensitivity. It is available in Cherry, Oak, Maple and Sapele veneers. The enclosure is twin ported and uses a Deflex panel to minimize internal standing waves. The SE version ($999/pair) offers premium wood finishes in Birds Eye Maple, Rosewood and Teak. Pennsylvania-based Emotive Audio's focus on tube amplification has expanded. The new Caeli 300B is a single-ended monoblock power amplifier available in standard and custom LE versions, the latter featuring hand-etched metalwork by metal artist Jacob Rogers. Pricing is $16,600 Canadian per pair as announced at the recent Montreal show (see show report by clicking here). Resolution Audio, maker of the famous CD-50/CD-55 CD players, now introduces the latter's replacement in the Opus 21 two-box CD player dubbed "the first in a line of innovative two-channel components". Technical highlights include four Burr Brown PCM1704 24-bit converters, 16x digital filter upsampling to 705kHz/24-bit data density, analog-domain volume control to maintain full converter resolution at any volume setting, and balanced or single-ended outputs for direct-drive connection to any power amplifier. Features that go beyond the former CD-55 are an improved analog output stage; a slot-loading CD/ROM drive mechanism for improved disc reading and reliability; a 96kHz/24-bit digital input; and an external power supply with central display to eliminate display-induced noise. Both chassis are aluminum to prevent magnetic interference common with steel. Dimensions are 9.5" x 9.8 "x 3" (WxDxH) each. The International Federation of the Phonographic Industry (IFPI), who "represents the international recording industry in the fight against music piracy and promotion of copyright laws for the digital era", has now officially released the 2001 sales figures as compared to 2000. According to the IFPI, the legal global music marketplace figures fell 5 percent in value (to $33.7 billion) and 6.5 percent in units. The breakdown of format sales include CD albums (-5 percent), CD singles (-16 percent) and cassettes (-10 percent). Jay Berman, Chairman and CEO of IFPI, said: "In 2001 the international recording industry was caught in a perfect storm, buffeted by the combined effects of mass copying and piracy, competition from other products and economic downturn. The industry's problems reflect no fall in the popularity of recorded music: rather, they reflect the fact that the commercial value of music is being widely devalued by mass copying and piracy." On an interesting note, sales in France increased by 10 percent while the UK was up 5 percent. Please note that the 18 of the top 20 best selling albums in France were of French repertoire while in the UK their very one musical artists scored the top seven recordings sold. Meanwhile in the financially challenged and high unemployment rate country of Brazil, sales were down a staggering 25 percent while Mexico was down 16 percent. British subwoofer specialist REL has added the 3rd generation, redesigned Studio ($9,000) to its lineup. The Studio III boast an impressive claimed low-end extension to 10HZ and sports dual 10-inch "Volt" drivers in a down-firing array that are powered by a 500-watt, high-current, DC-coupled internal amplifier. Neutrik SpeakOn high level inputs are augmented by XLR inputs for differential amps and dual RCA low level inputs. Separate attenuators for the low and high level circuits allow simultaneous connection to a music amplifier and surround sound processor. Available finishes include Rosenut, Cherry or Black Oak, and a glass top is standard. Dimensions are 27" x 24.5" x 22.5" (WxHxD), and weight is a very substantial 287 lbs. Old School meets New Wave as the Panasonic's B-flat CQ-TX5500D (approximately $800) double DIN in dash automobile CD player is the world's first to employ a vacuum tube, yet also play MP3 CD-Rom discs. Employing a tube in the pre-amplification stage, the B-flat produces 16 watts (nominal) into 4 channels (45 watts per channel peak). An auxiliary input allows for flexibility of additional source components such as a portable cassette player or MiniDisc. Overall dimensions are 178mm x 100mm x 160mm while the unit weighs in at 2.3Kg. The CQ-TX5500 includes and AM/FM radio, allows for choosing folders on an MP3 CD-Rom, track selection on audio CD discs, and provides for single button random playback and repeat. A wireless remote control is also available. Visual features include the ability to view the tube while "old school" backlit analog UV meters show power output. Playback abilities include MPEG-1 Layer 3 (32kbs-256kbs), MPEG-2 Layer 3LSF (16kbs-160kbs). CD playback frequency response is from 5Hz to 20kHz. No date set for availability within the USA. The Anthem brand of Sonic Frontiers International, a subsidiary of Paradigm, has reissued its MCA series of amplifiers for power supply, circuitry and parts enhancements. The Models MCA 2/3/5 Version II have become the MCA 20/30/50, with the first numeral indicating the number of channels. A higher chassis has allowed the use of larger capacitors and power transformers to increase power output to 225 watts into 8 ohms. The new MCA amplifiers carry pricing of $1,199, $1,499 and $1,999 respectively. Ultralink Products Inc. has finalized its operating plans with the purchase of the assets of XLO Electric Co. Inc. The parties announced the acquisition on January 7th, 2002 in Las Vegas at the Consumer Electronics Show. Ultralink Products Inc. acquired the worldwide usage rights to the XLO brand, along with assets including inventory and intellectual property. To allow for this expansion, Ultralink has obtained additional manufacturing space adjacent to its existing facilities in Southern California. XLO�s founder and Chief Designer, Roger Skoff, will continue to design the brand�s products and supervise its assembly craftspeople from the combined facility. The Shanling CD-T100 is a tubed High-End Chinese CD player that uses the CS8420 sample rate converted chip for a 96kHz sampling frequency, the second-generation PMD-200 24-bit/96kHz for HDCD decoding and four paralleled PCM1704 as main DACs. 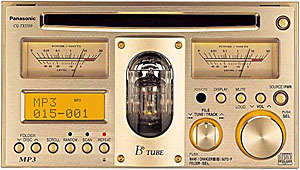 The most unusual design element is the top-mounted tube output stage with four transformers that not only drives the analogue outputs but also powers the headphone jack. The Montreal show priced the CD-T100 at $3,000 Canadian. With the current exchange rate, this could translate into a $1,500 - $1,800 US price. Interested readers should contact the company for more details. The hosting of so-called "Super Systems" appear to become a tradition-in-the-making at audio tradeshows and events, with the Million Dollar System only the latest such installment at CES 2002. For the upcoming PRIMEDIA Specialty Group Inc. Home Entertainment Show 2002 in NYC, Sony and EgglestonWorks announced what Sony calls "the most ambitious SACD presentation to date". Located on the hotel's second floor in the Nassau Suites A & B, this 5.1 demonstration system will feature the next generation Andra II speaker system from EgglestonWorks, Transparent Cables and Manley Laboratories Neo Classic 250 amplifiers, all supported on Grand Prix Audio stands. Sony will bring the latest SACD software titles as well as comprehensive selection of SACD players and host a press panel discussion (Thursday, 9:00 a.m.) on new SACD source material, future title releases and SACD players currently available. At 5:00 p.m. the same afternoon, EgglestonWorks will host a second press panel. Australian firm Halcro has added the dm10 pre-amplifier with built-in phono stage as well as the 180 watts per channel dm38 stereo amplifier. Both products are expected to roll out June/July 2002. The Halcro dm10 pre-amplifier includes a remote control, multiple inputs selection and the phono stage offers variable capacitance and resistance adjustment controls.